MORRISTOWN, NJ. 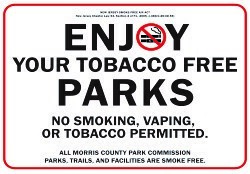 The Morris County Park Commission, which manages 20,197 acres consisting of 38 facilities, 244.3 miles of trails, including 73.3 miles of Patriots’ Path trail, recently announced a No Smoking Policy to conform with the New Jersey State’s Chapter Law 64 of prohibition of smoking at public parks and beaches. The Park Commission has determined that, Berkshire Valley Golf Course, Flanders Valley Golf Course, Pinch Brook Golf Course, and Sunset Valley Golf Course are the only park facilities where smoking is to be permitted by the public. Smoking is only permitted on turf play areas, excluding designated practice area, including driving ranges.